Purchase now and we'll ship when it's available. Estimated in early May. You have choices. Customize now. Our contemporary take on the daybed curves an asymmetrical retreat that promises a comfortable recline in any position. 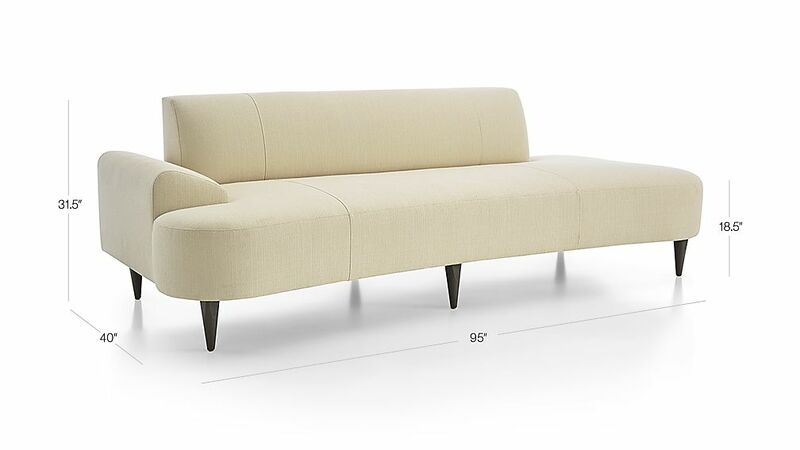 Bella's round tapered legs and a sinuous silhouette flirt with mid-century design, while the organic lines, single block arm and open bumper end feel right in the moment. The textured basketweave upholstery keeps the look casual and approachable. The Bella Daybed is a Crate and Barrel exclusive. We offer standard, express and next day delivery. Check the rate chart for delivery fees. Earn $189 in reward dollars* on this purchase when you use your Crate and Barrel credit card. Tips for welcoming your new furniture home. Joren Diamond Pattern Pillow 18"
NewMica Plaid Square Pillow 18"
Washable slipcover. Refer to additional Care Sheet. Spot clean with mild, water-free cleaning solvents only. Do not use water or dry clean. Always test a small inconspicuous area first. Blot spills immediately with a clean, absorbent white cloth. Rotate cushions and pillows weekly. Vacuum regularly. Professional upholstery cleaning recommended annually. Avoid direct sunlight. Fabric fresheners and protectors are not recommended.